https://www.golfdiscount.com/adams-women-s-new-idea-hybrid-irons?___store=default 11491 Adams Women's New Idea Combo Irons https://media.golfdiscount.com/catalog/product/n/e/new-idea-womens-combo-1.jpg 499.99 499.9900 USD OutOfStock /Golf Clubs /Golf Clubs/Irons /Golf Clubs/Irons/Hybrid Set /Closeouts /Closeouts/Golf Clubs /Closeouts/Golf Clubs/Irons /Golf Clubs/Womens /Women's Golf Clubs, Golf Balls, and Golf Apparel Adams Golf and their new Women's Idea irons gives you a set that is sure to be, for lady mid- and high-handicappers, exactly what a game-improvement set of irons should be - more forgiving on mis-hits. Adams Golf and their new women's Idea irons gives you a set that is sure to be, for lady mid- and high-handicappers, exactly what a game-improvement set of irons should be - more forgiving on mis-hits. 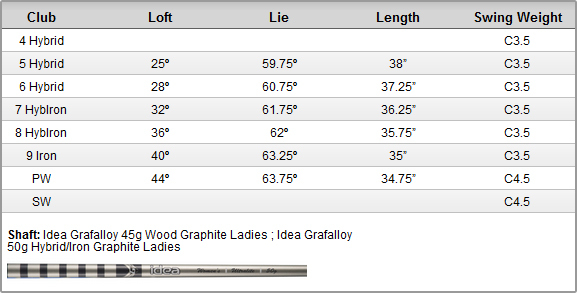 The new womens's Idea irons set is a unique, non-homogenous composite set of the following: hybrid long irons (3-5), hollow-bodied mid-irons (6, 7) and extreme perimeter-weighted short irons (8-PW). By swapping long irons for hybrid clubs, which have a lower center of gravity, Adams has made it easier for higher-handicap women players to get the ball airborne. But, the most distinguishing feature of the new Idea irons is the inclusion of strategically-placed slots in every club that are designed to create springier faces and deliver more distance. While the crown and sole of the new Idea hybrids feature the same, newly-designed vertical channels found in the new Adams Tight Lies fairway woods, the hollow-bodied mid-irons (6- and 7-irons) have channels in the topline, the sole and in the toe area to enlarge the sweet spot and create more ball speed. The cavity-back short irons were built with slots in the sole and toe area. With a 270-degree slot that wraps around the head of the middle and short irons - misses out on the toe of the iron will still create respectable control and ball speed on off-center hits. Compared with previous versions of Idea irons that didn't feature slots, Adams adds that the new women's Idea irons are getting 29 percent more ball speed on toe shots. Golf’s a hard game. And Adams along with their women's new Idea(s) that are more forgiving and easier to hit give you the power where you need it most – across the entire clubface.